Fire safety should be a top concern for campsite and caravan park owners. Whether you just let out a small parcel of land, or run a multi hectare campsite, you can’t shirk your fire safety responsibilities. According to Direct Gov, a fire can destroy a tent in less than a minute and nearly one caravan catches fire every day. Keeping good, well-stocked fire points at regular intervals across your site is crucial to keeping customers safe. It is also essential if you are to get and keep a campsite or caravan park licence from the local authority. 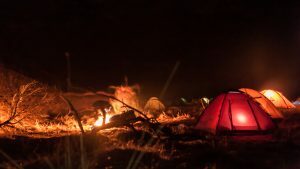 Licences are essential for permanent and seasonal campsites that host tents for 42 consecutive days at a time or more than 60 days in 12 consecutive months (except in Scotland). A good fire safety record is one of the big pre-conditions on which campsite licences rest. And they are subject to regular inspections by the local authority. Gas safety certificates, spacing between units, fire points and other aspects may be inspected, and failure to comply with site licence conditions may lead to prosecution. Your fire point needs to be safe and it also needs to pass inspections from your local authority. Conditions laid out in the Caravan Sites and Control of Development Act 1960 represent a model of good practice that local authorities should consider when awarding campsite licences. The legislation lays out some measures of good practice, but it also gives a high degree of authority to the local fire service, which it says the council should consult on local conditions and requirements. For this reason, it would be a good idea to contact the local fire authority and see what their recommendations are. It may be that local weather patterns require more fire points than is standard across the country. As good practice, the legislation recommends that fire points should be no more than 30 meters from a fire point. This means that you should lay out your campsite with fire points in mind. You should also ensure that tents, motorhomes and caravans are pitched at least 6 meters apart to prevent the spread of fire. The guidelines also call for fire points to be housed inside weatherproof structures, that are easily accessible and well labelled as a ‘Fire Point’. Where water standpipes are provided and, and there is a water supply with a good enough flow to shoot water about five meters, these standpipes should be positioned at every fire point. The standpipe should be fitted with a reel conforming to British Standard 5306 Part 1 and a hose that’s at least 30 meters long. Everything should be well marked and ideally housed in a red box with the words ‘Hose Reel’. Where standpipes are not provided but there is a water supply of sufficient pressure and flow, fire hydrants should be installed within 100 metres of pitches. Access to hydrants and other water supplies should not be obstructed or obscured. If your campsite is not well equipped with standpipes and hydrants and there is no way of boosting the water pressure to substantial levels, you must provide standalone fire points. These should contain two fire extinguishers, two filled fire buckets and ideally a hand pump or bucket pump. Many smaller campsites and temporary campsites (such as at festivals) will have this arrangement. There should also be some type of alarm to alert other campers tot the danger. This can be a large gong and striker or a hand operated siren. You should also display advice on the best way to contact the fire authority. For quick fighting of small fires or for different types of fire it can be a good idea to have fire buckets outside tents and caravans or at more regular intervals to help prevent small fires spreading. It is important that you make sure this equipment is in place. If you have recently bought a campsite it is important that you check it complies with the regulations because the previous owner may have neglected them. Fire buckets can be filled with water, coarse sand or special fire ‘absorption’ powder. They require very little maintenance and are useful for tackling small blazes before they have a chance to develop into larger blazes. Fire buckets are particularly useful in outdoor environments where there is a higher than normal risk of fire, such as on petrol station forecourts and on campsites with lots of flammable structures. 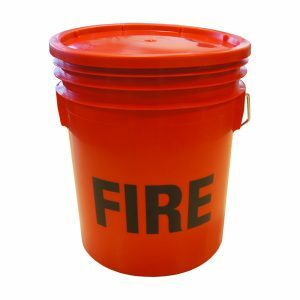 H&O Plastics manufacture and sell high quality plastic fire buckets that are designed to withstand the elements and live outside for a long period of time. Bold colours and lettering also make these buckets easy to spot in an emergency. Apart from having a well-stocked fire point, there are lots of other fire safety tips and tricks that can make your campsite safer for customers and more likely to pass a licensing inspection. Make sure tents and caravans are pitched at least six meters apart to prevent the spread of fire. Keep the overall density of your site low too, you should have no more than 30 caravans per acre. If your site has any huts or semi-permanent structures then you may be governed by separate, more serious fire safety concerns. Think about emergency vehicle access. Is there enough room for emergency vehicles to enter and turn around on your site? Is the site well signposted? Make sure LPG gas bottles are stored safely. Cut back vegetation and other things that could be combustible. Make sure equipment, like fire extinguishers and fire reels are well maintained. Ensure that fire buckets are filled with water, sand or fire absorption powder.